It's super simple to make, makes the kitchen smell delish, and tastes amazing. It is so moist and flavorful, you won't even want to douse it with ketchup. There are crunchy little pieces of oat in the pan that will make you drool. And the slices of leftover meatloaf eaten cold? Oh, be still my heart. 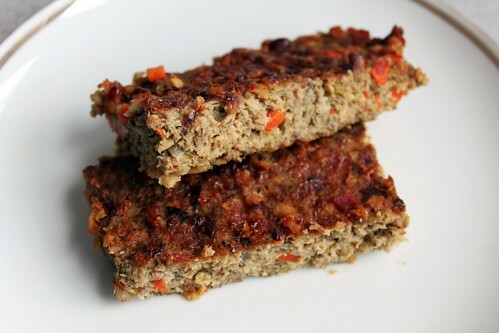 Breakfast meatloaf is my new favorite food! I love this so much I may even make it for other meals of the day. This recipe calls for seasoned pork breakfast sausage that is ground meat, not sausage links. If you can't find pre-seasoned ground pork sausage, you can use plain ground pork and season it yourself with a mixture of spices, such as this one. Heat oven to 350º F and generously oil an 8" x 8" pan with coconut oil. 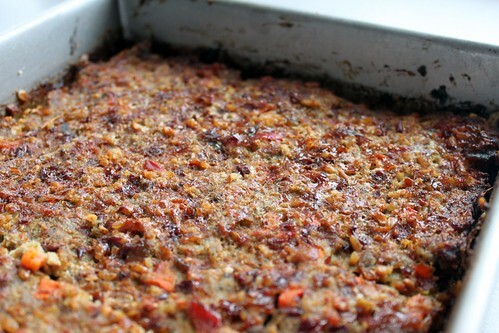 Sprinkle with oats; it won't be totally covered but try to get a decent dusting across the bottom and sides of the pan. Place oats in a small bowl and pour water over them; let them soak while preparing other ingredients. Heat 2 Tbsp oil and add onion, celery, and carrot. Saute over medium heat until vegetables are soft, then add herbs, spices, salt, and pepper, and stir to coat vegetables. Saute for 1-2 more minutes and remove from heat. Combine egg, ground meat, cooked veggies, and soaked oats in a bowl. You can use a spoon, but I just mush it all together with my hands. It works much, much better. Don't be a sissy. Get in there and touch that meat. Transfer meatloaf mixture into prepared pan, and smooth top with your fingers or a silicon spatula. If using, brush surface with Kim's Magical Meatloaf Glaze. Then gently pour 1/2 cup of water over the top of the meatloaf (I'm serious). Place in oven uncovered and bake for 55 minutes or so. Let sit about 5-10 minutes before slicing. Serve hot or cold. I like it with a big heaping scoop of homemade sauerkraut! 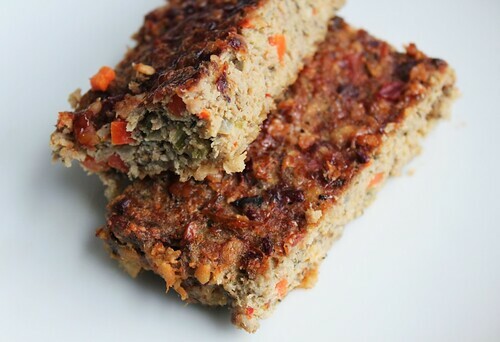 I often use this glaze on pork or turkey meatloaf instead of ketchup; it has a sweet, salty, yummy flavor. I used homemade honey-sweetened nectarine hot pepper jam this time around, but I generally use high-quality, no sugar added jams from Fior di Frutta or Bionaturae. Peach, nectarine, or apricot go well with meatloaves made from pork and/or turkey. I haven't tried it on beef, let me know if you do! Whisk all ingredients together in a small bowl, and spread over meatloaf before baking. Easy!